Vice President, Prime Minister and Ruler of Dubai, His Highness Sheikh Mohammed bin Rashid Al Maktoum, His Highness Sheikh Mohamed bin Zayed Al Nahyan, Crown Prince of Abu Dhabi and Deputy Supreme Commander of the UAE Armed Forces, H.H. Sheikh Humaid bin Rashid Al Nuaimi, Supreme Council Member and Ruler of Ajman; H.H. Sheikh Saud bin Rashid Al Mu'alla, Supreme Council Member and Ruler of Umm Al Qaiwain and H.H. Sheikh Saud bin Saqr Al Qasimi, Supreme Council Member and Ruler of Ras al-Khaimah, attended on Tuesday a reception hosted by Mohamed Alabbar, Chairman of Emaar, on the occasion of the wedding of his son Rashed to the daughter of Abdul Aziz Al Ghureir. The ceremony, held at Dubai World Trade Centre, was also attended by H.H. Sheikh Hamdan bin Mohammed bin Rashid Al Maktoum, Crown Prince of Dubai; H.H. Sheikh Ammar bin Humaid Al Nuaimi, Crown Prince of Ajman; H.H. Sheikh Rashid bin Saud bin Rashid Al Mu'alla, Crown Prince of Umm Al Qaiwain; H.H. Sheikh Mohammed bin Saud bin Saqr Al Qasimi, Crown Prince of Ras al-Khaimah; H.H. Sheikh Ahmed bin Saeed Al Maktoum, Chairman of Dubai Civil Aviation Authority and Chairman of Emirates Group; H.H. Sheikh Ahmed bin Mohammed bin Rashid Al Maktoum, Chairman of Mohammed bin Rashid Al Maktoum Knowledge Foundation; H.H. 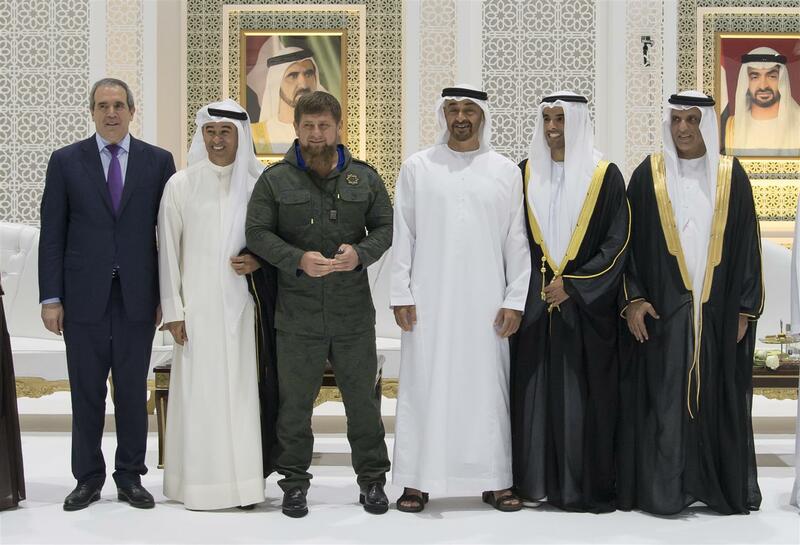 Sheikh Mansour bin Mohammed bin Rashid Al Maktoum; Sheikh Hamdan bin Mubarak Al Nahyan; Brigadier Sheikh Nasser bin Hamad Al Khalifa, the Bahraini Royal Guards Special Forces Commander and Chairman of the Supreme Council for Youth and Sport (SCYS), President of Chechnya Ramzan Kadyrov, a number of Sheikhs, and dignitaries. Sheikh Mohammed bin Rashid and Sheikh Mohamed bin Zayed congratulated the couples and their families and wished them blessed and happy family life.